This month we’ll head way out west, to the California coast and Long Beach State University. This particular facility made it for a design that only two other buildings resemble. In 1994, when the new basketball arena opened, it immediately became recognizable. 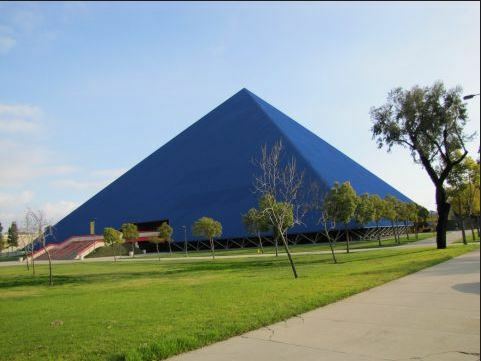 Originally known as Long Beach Pyramid (now Walter Pyramid), the arena is just that…a pyramid. Only the Luxur Hotel & Casino in Vegas and the old Pyramid in Memphis (becoming a Bass Pro Shops) have a similar design, making this the only sports facility with that unique shape. The building can be seen from a distance and the dark blue aluminum panel makes for an even more distinctive look. Statistically, this is a “perfect pyramid” with each side measuring exactly the same (345 feet). Inside, the shape makes for an eye-catching look above as the towering, opaque roof joins at three sides to make a point at the top. During a break in the action, one can’t help to peer above. The interior set-up is spacey as the 5,000 seat capacity features gaps between each of the four black and yellow seating sections. Concessions and walkways are all under the pyramid with the court visible as there is not really an intermediate concourse. While seating structure isn’t all that different from other basketball arenas, the setting certainly is. The Beach has a good fan base and coming to the Pyramid is probably one of the more intimidating places in the Big West. This may be a laid-back part of the country, but the 49ers draw well and students always come out in droves and bring some noise. Check out Walter Pyramid for the remarkable architecture, while taking in one of the solid teams and experiences in the Big West Conference.